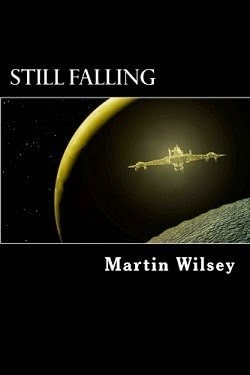 Martin Wilsey is the author of the science fiction novel Still Falling. This is my first novel. I actually started writing the book as a way to keep from going stir crazy after a bad injury to my spine. TV and Facebook get real old, real fast, when you’re trapped in your recliner. I have been a science fiction lover for as long as I could read. I still read a hundred books a year and they are mostly Scifi and Fantasy. I am lucky enough to know a few published authors and they gave me a lot of great advice. Advice about tools to help me write. Advice about how to power though and get the first draft done. All their advice has served me well. Still Falling is a story about a man named Barcus, that crashes to the planet Baytirus after the destruction of a deep space survey ship. It follows his struggle to survive with the help of a powerful Artificial Intelligence, housed inside a spider like, all terrain vehicle, that is specifically designed help him. Finding himself in the middle of some kind of genocide he slowly begins to discover who murdered everyone he knew and cared about in the universe. I think the people that will like it the most are readers that enjoy an escalating epic story, that ups the ante. Also, people that love a good mystery with their science fiction, deep foreshadowing, world/culture building and strong female characters. I’m told that people that love the second amendment also love the book. Still Falling is your first novel. What inspired you to move from just having an idea to publishing your first novel? 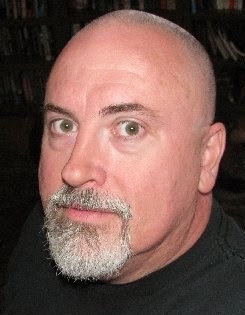 My brother Eric died suddenly died when he was 53 years old. I still miss him. His loss got me really thinking. It really made me think about what I wanted to get done before I was done. Publishing a novel was on the list. When you decided you wanted to write Still Falling, did you have to consult any writing resources before starting the manuscript? Or did you just dive into the manuscript? I just dove in. I had a general outline to the story I wanted. It’s amazing where characters decide to go. It’s not always where you expect to go. Is the process of writing a science-fiction novel different than writing a mystery novel? Does the process of having to create another world with a different set of rules make writing the plot more time-consuming? It is more work when you have to create the foundations of a new world, a new culture, a new religion. Even clothes. So I guess it is more time-consuming but it also more fun, more interesting, more creative. I’m sure I have been influenced. The list would be way too long for this interview but some of the biggies would be: Robert Heinlein, J.R.R. Tolkien, Arthur C. Clark, Orson Scott Card, Larry Niven, Terry Brooks, Terry Pratchett, Simon Hawke, Jim Butcher, Lois McMaster Bujold and more. What made you decide to write your story as a trilogy? Do you have the entire trilogy planned out? I personally love stories that are a series. I personally love series where each book is a fully realized novel on its own. So I am writing the kind of books I love to read. The entire trilogy is planned out. Book 2: The Broken Cage has already been written and I have already started Book 3: Blood of the Scarecrow. If you closely read the headers of each chapter you will realize that these books are a reassembled narrative that led up to the Solstice 31 Incident, that occurred on December 22, 2631. This investigation occurred 32 years later in 2663 due to the discover of new evidence. I hope people enjoy reading it as much as I did writing it! Barcus crashed back into consciousness when his face smashed into the inside of his helmet. He was in a three axis tumble. He knew the feeling. All inertial dampening was off. His maintenance suit was powered up, docked in place, but off-line. He coughed and could feel blood spray into his helmet. Great! His nose was probably broken. Again. Then he began to remember. His mind was coming back on-line. “Status! Visual!” His helmet systems came alive. Temperature and pressure were normal. He confirmed it was a freefall spin. Wherever he was, it was pitch black. “Lights!” The suit’s work lights all activated. He saw immediately that he was locked into the suit dock on the bridge of Chen's shuttle. Chen was strapped into the command chair. Her flight suit didn't have her helmet, and her arms swayed with her neck in the tumble. The shuttle seemed dead. The shuttle bridge was all white in the suit’s harsh work lights. It was a perfect oval dome around them, like they were on the inside of a huge egg. The command chair was in front left. Two support stations were behind that and the four passenger seats. He hammered the EXIT control in the suit causing its helmet chest plate to hinge open and back. He pounded the restraint release in the center of his chest, and the straps retracted smoothly, freeing him. In the chaos of the tumble, he slammed first on the ceiling and then into the seats, but he managed to cross the compartment to grasp Chen's belt. As he felt for her pulse, her eyes fluttered open. She blinked for a moment and focused by force of will, saying, “Display Delta” to the air, as something impacted the exterior of the shuttle. Suddenly, it was like they were in a convertible, the dome turning into an exterior display. They were in a gut churning three axis, high-speed spin with no control. Debris tossed all around them. Some more chunks crashed into them, slowing the spin along one axis. The suit was locked into place in the dock. Otherwise, the heavy armor thing would have killed them by now, crashing about loose. Barcus could see life pods and other shuttles that had managed to get aloft from other bays, but they were destroyed by plasma cannon fire. “Chen. Don't stabilize.” Suddenly a giant explosion destroyed what was left of the main ship. The shock wave crashed more debris into the shuttle. “Display, Baker,” Chen said weakly. It changed to a 3D rendering of the ship tumbling with massive chunks of debris. The display showed the expected path of the shuttle to its crash to the planet. “Barcus...I'm bleeding...bad.” He could see the blood splattered on her neck, flowing up from inside her pressure suit. “Is the cabin holding pressure? Do we have a breach?” Barcus asked. “Slow the tumble with manual thrusters,” Barcus said. Chen did until the ship was just turning gently. Chen's eyes fluttered again. “Shrapnel in my guts, man. It's bad. Listen...” She fell unconscious again. “Status Report!” The count moved to three. “Chen, wake up. I can't fly this thing.” Her faced winced in severe pain. Then her eyes opened. “Stu. Activate AI, Emergency. (Gasp) Pilot injured...grant full master control authority to Roland Barcus. Present. All systems.” She winced and fell silent, except for the occasional gasp. Barcus had to hold tight in the weightlessness. “Population there?” Barcus asked, looking at the tactical map display. “Unable to tell with passive scans only. Little to no population expected. Harsh climate and terrain in that region. Cold temperatures. Estimate, -4 Celsius,” Stu reported. “We need to continue to look like debris as we descend. Grav-foils only until we need the engines and even then, thrusters only. Can we wait until we are well within the atmosphere?” Barcus asked the AI. “Yes, sir. Our Polycarbon hull can withstand unpowered re-entry temps easily.” The computer was calm. “Find a nice ledge in those mountains and set us down, Stu. Grav-foils only.” He began unstrapping Chen. “Chen.” He said. She winced as Barcus moved her. “This shuttle has a med bay. Stu. Stop all tumble. I need free fall in here.” Moments later, the tumble sense was gone. He drifted gently down to the lower level and into the infirmary with Chen. The med bay was the dominant feature at this end to the front of the hold. The door slid closed behind them as Barcus set her on the scanning table still in her spacesuit. Drops of blood drifted everywhere. A vacuum sound began emitting from the table and the floor while a fluids-elimination unit kicked on. The blood was sucked down to collectors. The midsection of Chen’s suit was shredded. The unit scanned her and confirmed that her injuries were beyond the abilities of the auto-doc. Barcus felt his weight begin to return as the Grav-foils activated in preparation for landing when the ship entered the atmosphere. If they were being tracked, now was when their deceleration would be noticed.